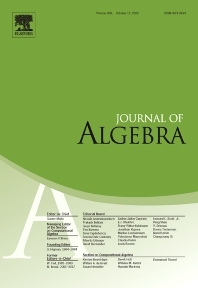 The Journal of Algebra is a leading international journal and publishes papers that demonstrate high quality research results in algebra and related computational aspects. Only the very best and most interesting papers are to be considered for publication in the journal. With this in mind, it is important that the contribution offer a substantial result that will have a lasting effect upon the field. The journal also seeks work that presents innovative techniques that offer promising results for future research. The Computational Algebra section has been introduced to provide an appropriate forum for contributions which make use of computer calculations and to broaden the scope of the Journal. • Results obtained by computer calculations - to be suitable for publication such results must represent a major advance of mathematics. It is not sufficient to extend previous computations by means of higher computer power. Rather the contribution has to exhibit new methods and mathematical results to be accepted. • Classifications of specific algebraic structures (in form of tables, if appropriate), which are not easily obtained and are useful to the algebraic community. • Description and outcome of experiments, to put forward new conjectures, to support existing conjectures, or to give counter examples to existing conjectures. • Papers emphasizing the constructive aspect of algebra, such as description and analysis of new algorithms (not program listings, nor, in the first instance, discussions of software development issues), improvements and extensions of existing algorithms, description of computational methods which are not algorithms in the strict sense (since, e.g., they need not terminate). • Interactions between algebra and computer science, such as automatic structures, word problems and other decision problems in groups and semigroups, preferably, but not necessarily, with an emphasis on practicality, implementations, and performance of the related algorithms. • Contributions are welcome from all areas of algebra, including algebraic geometry or algebraic number theory, if the emphasis is on the algebraic aspects. Contributions describing applications of algebraic results or methods, for example in coding theory, cryptography, or the algebraic theory of differential equations are highly welcome. An important general criterion for the publication of a paper in the Computational Algebra section is its emphasis on the constructive aspects. This journal has an Open Archive. All published items, including research articles, have unrestricted access and will remain permanently free to read and download 48 months after publication. All papers in the Archive are subject to Elsevier's user license.